I was taught to never say "Trailer Park" by my parents who lived in a Mobile Home Community in the 2000s in Peoria, Arizona, a suburb of Phoenix. And since I remember it well, it occurs to me that you may have never spent time in a Trailer... oops, I mean Mobile Home Community. Let's go visit. The Trailer... I mean Mobile Home Community where my parents lived was for people 55 and better. You never said "older", you said "better". Get ready for a LOT of rules! 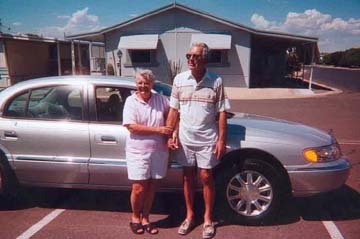 My parents were "snowbirds" since 1989, when I moved back to Phoenix from Los Angeles. No, they didn't stay with me, they started out staying in an apartment in the same complex where I lived, which was specifically for winter visitors. It rented monthly, and included everything you would need, not just furniture but dishes, pots and pans, that sort of thing. Then they found a rental condo, which was actually pretty darned nice, over on the El Caro golf course. I'm pretty sure the condos are still there, but the golf course itself has been abandoned. It was a nice little course at one time, and I played it often, and would stop at my parent's place, which was near the 7th hole. But my parents are more thrifty than that - good Midwestern "value for money" people, like I am. And they eventually bought a Mobile Home in a Trailer... I mean Mobile Home Community. What they had was called a "double wide" - you can see the seam in the middle where two trailers were put together, so it wasn't quite as narrow as you might imagine. Not big, but not claustrophobic, either. This is how it works: you buy the trailer, but you rent the space. I visited there a lot, and have to admit that it's kinda cool - there's a community of people who all kinda look the same (grey hair and glasses), a swimming pool, community center, and lots and lots of things for the old folks, oops I mean persons of age, to do. Now let's talk about the rules, and why there are so many rules. A Mobile Home Community, like the one my parents lived in, is very aware of the stigma of "Trailer Parks". In my lifetime, I remember the trailer parks that I used to see over in my neighborhood by Lopers. They were places without any rules, or, as far as I could tell, laws. Great places for people who just want to be left alone, but scary places for law-abiding citizens, if you understand what I mean. Anyway, one of the rules that I didn't quite understand in my younger years is that you had to wear a shirt to go the pool. The pool was just a few steps from my parent's place so, I would change into my swimming trunks, grab a towel and go. No. I was told to put on a shirt. Now I understand - watching old men shirtless with big old bellies walking around isn't a pretty site. My dad might have been OK, athletic and fit even in his golden years, but most guys really needed to cover up. And that's just the beginning of the rules. The rules went on and on. And people there obeyed the rules, not because there was anyone in particular to enforce them, but because they wanted to live in a Mobile Home Community, not a Trailer Park. There's a big difference, and I learned that from my parents. Image at the top of this post: At the Casa del Sol Mobile Home Community in 2000, 91st Avenue south of Grand Avenue, Peoria, Arizona. Not a trailer park.